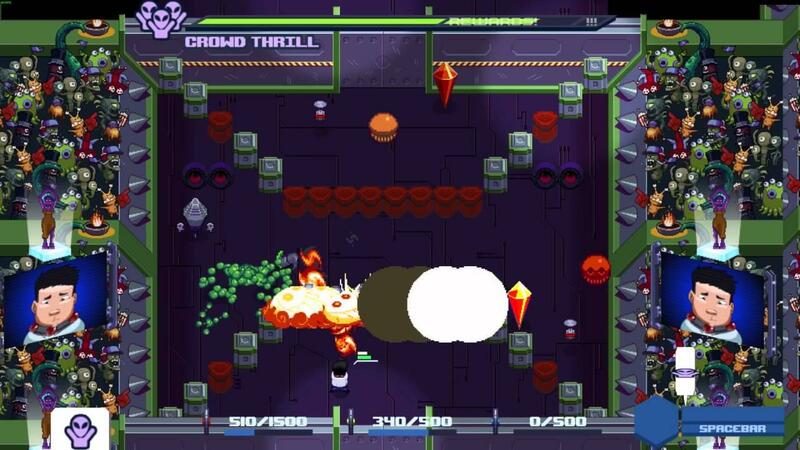 Today I checked out Satellite Rush, you're an office worker abducted by aliens and you need to please the audience by blowing stuff up in randomly generated rooms. Disclosure: Key provided by developer. I think it's a really great entry to the action roguelike scene, but it does bug me that you only have four directions to shoot in. You and enemies have more directions available to move, so it can make shooting them a little challenging at times. You have to try and keep the audience entertained enough for them to throw in guns, gadgets and health for you and it's quite a fun idea. The boss fights are pretty intense, with the enemies being massive and powerful and you're still, well, plain old you. It's a pretty good game for when you need some mindless action, as there's nothing to really think about other than moving and shooting. I will be checking it out some more when it has a few updates. You can find Satellite Rush on Steam.